Pictured above: Matt Torbenson is grateful for the UW-Green Bay MCW Green Bay partnership that made his transition from college student to medical student seamless. In back: left to right, UW-Green Bay Prof. James Marker, MCW Associate Dean Craig Hanke, UW-Green Bay’s Prof. Uwe Pott and Associate Dean Amanda Nelson. The idea of being a doctor starts simply with the desire to help. Yet, the path to get there — undergrad, medical school, residency and possible fellowship — can be daunting. This success story couldn’t come at a better time. Rural Wisconsin is experiencing a shortage of primary care physicians. In 2011, the Wisconsin Hospital Association predicted a shortfall of more than 2,000 physicians by 2030 if immediate action wasn’t taken — namely, producing 100 new physicians every year. Armed with this data, MCW developed satellite programs in Green Bay and central Wisconsin “…with the intent to train and increase the number of primary care physicians that can serve the northern and central areas of Wisconsin,” states Craig Hanke, Ph.D., associate dean of curriculum for the MCW-Green Bay campus. 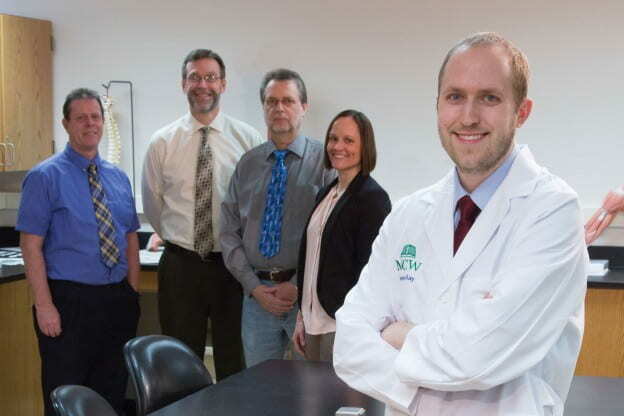 The Green Bay campus was chosen in large part because of UW-Green Bay’s wealth of highly trained faculty in the biomedical sciences, who have a strong passion for sharing their knowledge. When Shariff graduated in June of 2018, she was be the first in a growing line of students who were prepared for a medical path at UW-Green Bay. She will be followed by Matt Torbenson (pictured) and Angela Smet, each in their second of three years at MCW and 2018 UW-Green Bay graduates, Brittany Djurhuus and Nigel Tourdot. An impressive streak from a program that accepts candidates from across the nation. So, what’s in it for the UW-Green Bay faculty? Professors teaching the MCW curriculum spend additional time preparing for higher level classes and team-teaching with physicians and other researchers. This additional gathering and sharing of content provides “preparation on steroids” for undergraduates. Their dedication shows. Merkel and colleague, Associate Prof. Uwe Pott were named among MCW’s Outstanding Medical School Teachers for 2016-2017. The UW-Green Bay/MCW partnership has also changed the way undergraduate students are advised, creating better outcomes and often acceptance into medical school. “It’s still incredibly tough to get into medical school,” says Amanda Nelson, associate dean for the College. But the partnership influences what professors teach undergrads to better prepare them for medical school. “We want our best and brightest (students) to stay in the region and continue to practice for 20-30 years,” says Nelson. The hope is that these highly trained physicians return after residency to Northeast Wisconsin to practice medicine. The MCW-Green Bay campus acceptance criteria requires that students express a strong interest in staying local and completing their residency in a Wisconsin/Midwest setting. This entry was posted in Leading & Learning and tagged CSET on September 21, 2018 by Kimberly Vlies.